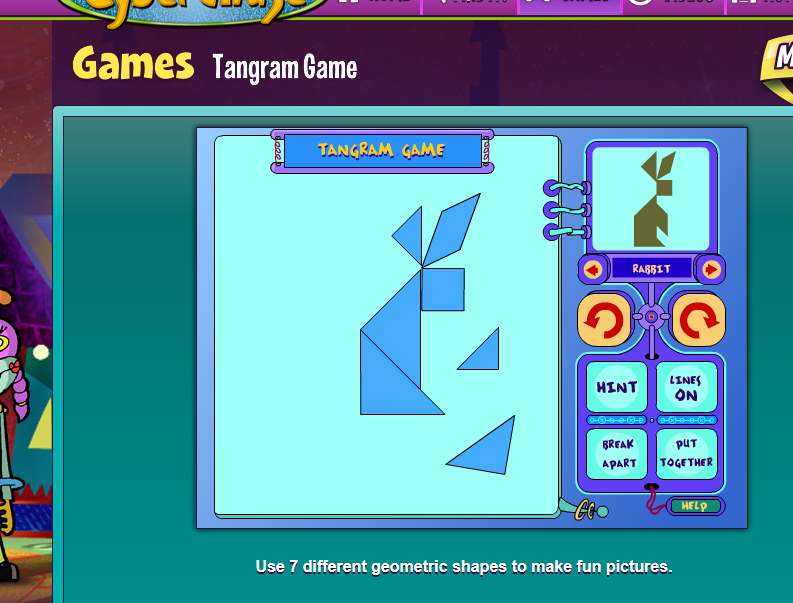 I love to give my students tangrams and let them explore spatial relationships while building patterns and recreating patterns from books like “Grandfather Tang” and “Tangramables”. If you are lucky enough to have plastic sets of tangrams you can set them up in a center with the books and let your children explore with the shapes. If you need to make your own tangrams, you can download a free pattern here. Print on card stock and cut out. You can also find some cute cards for using tangrams here. Head over to Teaching Ideas For Those Who Love Teaching to See step by step how to make these awesome 3D Shapes with Marshmallows and Toothpicks! Yum! Or … If you prefer paper shapes, Math Geek Mama has Free Printables to make your own shapes! Kids need to get out of their seat and move around! One of your best centers can be the scavenger hunt. Place questions around the room and give your students a record sheet to use while they work. For directions to make your own, see this post: Making A Scavenger Hunt. Or to use premade, print and go resources click here: Scavenger Hunt 1, or here Scavenger Hunt 2. These task cards are great for starting higher level discussions with your students. Students work together to answer questions identifying, comparing and analyzing critical attributes of 2 and 3 d shapes. Task Cards Save Paper: Using task cards can cut down on the number of copies and paper used because you don’t need to make a set for each student and if laminated or kept in protective sleeves, they can be used for years without printing new copies. Task Cards Increase Engagement: They add to student engagement because they add novelty. Paper and pencil practice is certainly useful, but can become dull and routine. Using dry erase markers on a task card can mix things up a bit. Also, task cards can be printed with fun colors and clip art to add interest for the students. Centers and or Work Stations – Print cards and keep in small containers or baggies. Have students work in pairs or groups solving problems on task cards and recording on a record sheet. I like using record sheets for two reasons. One, the students are more likely to stay on task if they know they will have to turn something in at the end of the center. And, the other reason, I like to look over the record sheets to see if students need re-teaching or extra help with the skill/concept worked on in the center. If you do not have a lot of copy paper you can always have students use notebook paper to create a record sheet. Have them write the name of the center on the paper and then number or letter their answers. Whole Class Cooperative Groups – My suggestions for whole class would be the same as for work stations & centers except you would need one set of task cards for each table group. After learning or reviewing a concept with whole class, the students could work on the cards with their table groups. After the group work you could have a class discussion about the task cards as a way to wrap up. Another whole class activity which would require only one set of task cards is a “Scoot” or circuit. To set up a Scoot you have a different task card on each desk and have the students work in pairs rotating around the set of task cards in numerical or alphabetical offer. Some teachers will set a timer for scoot and others will let students move as they finish. For a FREE “Scoot Record Sheet” that can be used with any set of task cards, click here. St. Patrick’s Day Classroom Fun! Are your little leprechauns looking for a pot of gold? St. Patrick’s Day can be a lot of fun and also educational! Here are a few great ideas! I guess it is no secret! I also love Math! March Math Freebie by ME! So, the fun and games of learning how to make arrays, skip counting on number lines and using models to solve multiplication problems has lead to the equally exciting task of solving division problems. Everyone seems to be making great progress and making meaning of multiplication and division in real world problems, UNTIL … wait for it … wait for it … We mix the two together! As I have mentioned in previous posts about fractions, starting with hands on and pictorial activities is vital for helping primary intermediate level students understand fractions. Today I would like to share my top 5 tips for decomposing fractions. These are mainly focused on 3rd – 5th grade, but may be helpful for some older and younger students as well. 1.) I love using my pizza game for hands on fractions! If you don’t have a pizza game, you can use plastic fraction circles or make pizza fractions from paper plates. Show your students a fraction of a pizza such as 5/6. After guided them to name the fraction, show them one way to decompose it by giving 2/6 to one student and 3/6 to another student. Point out that 2/6 + 3/6 is a way to decompose 5/6 and ask if they can name any other ways. Act out other representations such as 2/6 + 1/6 + 2/6 by giving those slices to other students. Try this with several different students. 2.) Give students color tiles or unifix cubes. Give specific directions such as make a rectangle with 3 red, 2 blue and 7 yellow. What fraction of your tiles are not yellow? (5/12) Move the red and blue apart a little to show how 5/12 can also be represented as 3/12 + 2/12. Do this with a few other fractions as well. 3.) Give students pictures of fractions and have them cut them up to show ways to decompose the fraction. 4.) Coloring Practice – Give students pictures of fractions with nothing shaded. Give them directions on what color to color different parts. Then guide them to write number sentences to decompose the fractions. 5.) Play Games! Make your own games to practice decomposing fractions or try one of the games I have available on my TpT page.